Colombia is currently undertaking the most important efforts in its history regarding to cluster development programs. One example is the Competitive Routes Program led by Innpulsa, a new Development and Innovation Unit under the Ministry of Trade, Industry, and Tourism, as part of Fiducoldex, the entity providing fiduciary solutions for commerce, industry and tourism sector. Other examples of clusters developments include the strategies undertaken by several Chambers of Commerce around the country. Through these efforts Colombia is starting to build local capabilities and teams that will allow these cluster agendas to growth and be replicated in other clusters and regions. 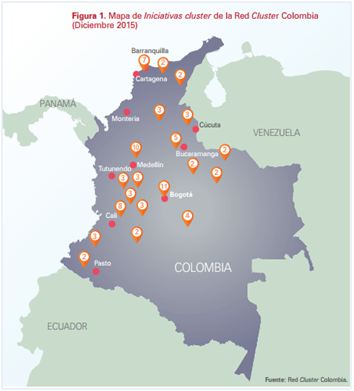 A preliminary count sums up to 87 cluster initiatives currently in Colombia. However, what Colombia is doing in terms of its cluster development efforts –hopefully as part of its modern industrial policy– it should be certainly something worth learning about. As the network that gathers all cluster efforts in Colombia, the RCC has set for his work in 2016 the design and test of a Tool for Cluster Monitoring and Evaluation. The Colombian Private Council on Competitiveness is an independent non-profit organization, which acts as a bridge between the public and private sector in competitiveness-related matters, through its participation in the National Competitiveness and Innovation System.